STS is a three piece tongue system which uses tabs to allow the tongue to be repositioned. Use STS to reposition the tongue to suit the shape of your lower leg for a personalized and more comfortable fit. STS (Strap Tongue System) is a three-piece tongue construction which allows the user to reposition the different layers of the tongue using strap pads. The padded layers of the tongue can be repositioned and easily adjusted to best suit the morphology of the lower leg. This extra personalized adjustment can greatly improve the security of fit around the ankle area improving comfort and minimizing excessive heel lift. The Extreme Thermal Protection footbed has superior thermal insulation performance to help protect against extreme cold. 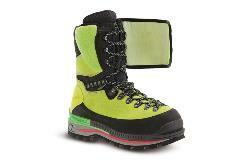 XTP is used on our Mountaineering and Expedition boots. The XTP (extreme thermal protection) is a special footbed with superior thermal insulation. The XTP footbed is made from a combination of a highly isolative felt material and a memory foam layer for superb underfoot comfort. XTP can be found in our Expedition and Mountaineering boots where it helps to protect against extreme cold. A thermal insulation system using Thinsulate® to completely surround the foot with no cold spots. The Thinsulate® lining is fixed in place with minimal use of adhesives to maximize loft. 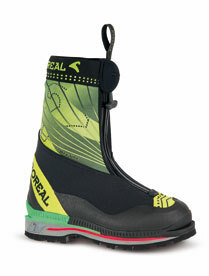 The base of the boot is uniquely insulated with triple Thinsulate® to minimize heat loss through the sole unit. TLS is a thermal insulation lining system which uses layers of Thinsulate® to completely surround the foot without cold spots. The Thinsulate® lining is fixed in place with minimal use of adhesives to maximize the loft and warmth of the lining. The floor of the boot is also insulated with a triple Thinsulate® layer to insulate the floor of the boot from conductive heat loss to the ground, especially important when crampons are fitted. This full Thinsulate® lining which extends underfoot gives Boreal mountain boots a significant warmth advantage. Mountain boots with uppers made from stiff materials can restrict the natural articulation of the ankle joint causing discomfort when walking and restricting the freedom of movement when climbing. Bi-Flex eliminates this problem by carefully positioning panels of soft pliable materials in specific areas of the upper. These soft compressible panels act like hinges to allow the natural articulation of the ankle in both the lateral and fore/aft directions. Hard incompressible components such as lace eyelets are either made from soft textile materials instead or repositioned so as to not cause pressure points or impede articulation. Bi-Flex greatly enhancing the ergonomics and comfort of high ankle mountain boots. Boreal have been manufacturing leather mountain boots for 40 years and nothing rivals premium quality leather for long term reliability. By combining a durable leather upper with a lightweight modern sole unit Kangri gives you the best of both; a synergy of traditional craftsmanship and new technology. Generously insulated with a triple Thinsulate™ lining Kangri is warmer than other single layer boots and is the favoured choice of many mountain professionals. 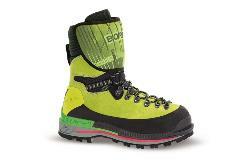 A perfect choice for ice/mixed climbing, general alpinism and also warm enough for lower peaks in the greater ranges. USAGE: Very cold conditions. Himalayan amd alpine climbing. Technical ice and mixed climbing. Our innovative Bi-Flex system allows the ankle to move freely greatly enhancing walking comfort and freedom of movement when climbing. The wrap-over tab adds security to the closure, keeps your laces neatly tucked away and protects your waterproof trousers from being damaged by the lace hooks and a three-layer tongue provides plenty of padding against pressure points and adds some useful adjustment. Boreal’s unique Dry-Line® waterproof breathable lining guarantees to keep your feet dry and has superior water vapour transmission performance. Kangri is fully compatible with automatic crampons and uses dual density crampon lugs, hard at the rear for a secure fit and soft at the front for reducing vibration when front pointing on bullet hard ice. The advanced carbon composite midsole is rigid, yet incredibly lightweight and ample underfoot cushioning is provided by dual density shock absorbing PU and EVA layers. Finally, our choice of a deeply lugged Vibram® Teton outsole will help keep you upright on the approach. Named after a breath-taking beautiful pinnacle shaped mountain in Norway, Stetind is a modern and lightweight mountain boot designed for technical alpinism, winter climbing and ascents of alpine peaks. Stetind takes full advantage of the best modern materials to give you more comfort, less weight and better climbing performance than ever before.